These lines uttered by Rick Blaine set into action events that change the lives of several unsuspecting people who find themselves in Casablanca at the onset of World War II. When you think about it, it’s not much of a plot and it takes place over the course of just a few days…nevertheless Casablanca went on to win an Academy Award for Best Picture and become one of the most beloved films of all time. 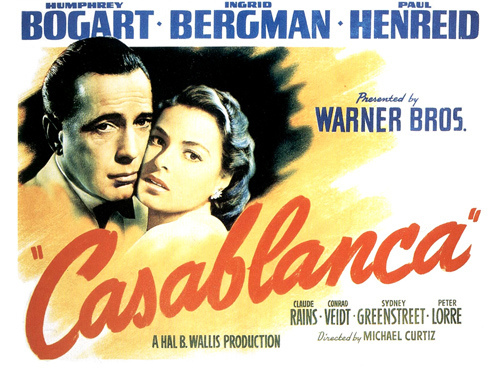 A great many films have been about more important subjects and featured far better performances, but there is something about Casablanca that resonates with so many film goers. It’s certainly a great love story. Rick and Ilsa fall madly in love in Paris but as the Germans roll in she leaves him standing at the train station in the rain. Why? Because the heroic husband she thought long dead has turned up alive. Upon running into each other again in Casablanca, she is torn by her feelings for Rick and her allegiance and love for her husband. At the same time, Rick finds himself questioning everything he believes in, and while he is heartbroken by the loss of Ilsa he knows the choices he must make are far greater than he. Yes, it doesn’t take much to see that the problems of three little people don’t amount to a hill of beans in this crazy world. It’s also a war movie, and World War II to boot. You have French patriots and Vichy sympathizers and Nazis, who always account for a great war picture! There is a mysterious American and hero of the underground. There are the profiteers like the unfortunate Ugarte and bar owner Signor Ferrari. You have the dueling national anthems. You have the intrigue of the passage to Lisbon and the murder of the German couriers. Renault: I’ve often speculated on why you don’t return to America. Did you abscond with the church funds? Did you run off with a Senator’s wife? I like to think that you killed a man. It’s the romantic in me. Rick: It’s a combination of all three. Renault: And what in heaven’s name brought you to Casablanca? Renault: The waters? What waters? We’re in the desert. And yes, the performances are enduring. Can you think of Humphrey Bogart and not think of Rick? No matter the great performances, Claude Rains will always be Captain Louie Renault. Ingrid Bergman won three acting Oscars…remember for what films? She was not even nominated for Casablanca. It doesn’t matter, she’ll always be Ilsa Lund. Casablanca is 102 minutes of movie perfection.